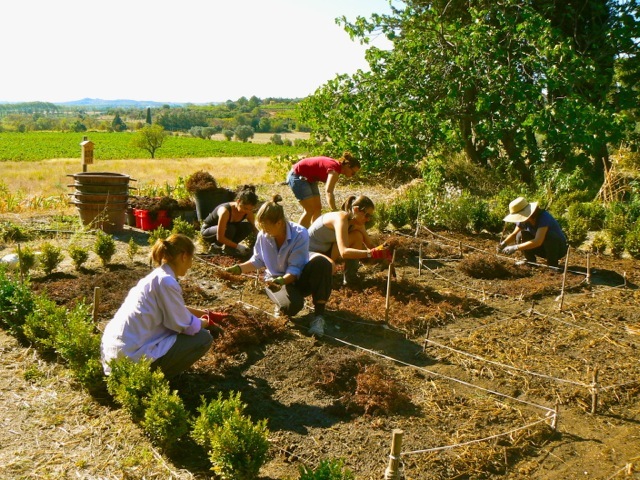 Regarding the soil, we have created in our garden buttes rich in nutriments (organic manure, green plants and crushed ground materials) and we have organized the plants in a complementary manner. 2. Take care of the human being: ourselves, our friends and the community. 3. Share fairly: To limit consumption and production while redistributing the left-overs. PERMACULTURE should become a sustainable production process able to meet our needs without reaching the environmental limits. This concept is expanding nowadays : we are sharing advice and experience within a local association "Gardening Together" and all its active members. Contact : jardinons_ensemble@yahoo.fr, tel (in french) Jaumeta 06 84 49 21 23, Nicole 06 82 45 78 00.